If you could examine an entire human eye, you'd see a sphere about an inch in diameter-the size of a large gumball. The eyeball itself is really three thin layers surrounding a fluid-filled center. The outside layer is the "white of the eye," called the sclera. It is the tough, opaque tissue that serves as the eye's protective outer coat. Six tiny muscles connect to it around the eye and control the eye's movements. The optic nerve is attached to the sclera at the very back of the eye. Curving out from the sclera, the clear cornea is the "front window" of the eye. The cornea is amazingly strong and protective against dust and germs. Packed with nerve fibers, it is also quite sensitive to pain. This pain sensitivity is one of the cornea's protective qualities; the pain is a signal that something is trying to invade the eye. Under the sclera is another thin layer, which consists of the iris-the eye's visible colored ring; when we say that someone's eyes are blue, brown, or green, we are talking about the color of the iris. Besides being an interesting and expressive feature of the face, the iris is essential to clear vision. It surrounds the round, black pupil-along with muscle fibers and blood vessels. The muscle fibers hold the lens of the eye in place and allow it to change its shape so that it can focus on objects at different distances. Located behind the iris and the pupil, the lens is about two-thirds water and one-third protein fibers. There are three distinct layers in the lens, sometimes compared to the layers of a peach: The capsule (the peach "skin") is a thin, clear membrane that forms the outside layer of the lens. The cortex (comparable to the peach "flesh") is the soft, clear material just beneath the capsule. The nucleus (the "pit" of the peach) is the firm center, or core, of the lens. The blood vessels, located toward the back of the eye, feed essential nutrients to the retina, a smooth, thin layer of nerve tissue at the back of the eye. 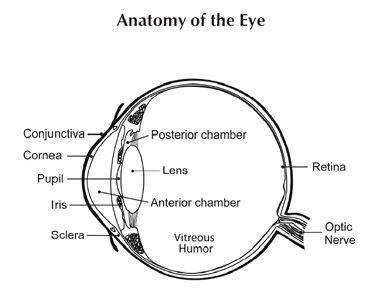 When you are looking at an object, the retina is where the image comes into focus. Most of the retina contains specialized cells that convert the reflected light (the image) to signals your brain can interpret. The macula is the focal point at the center of the retina. Within the macula are millions of lightsensitive nerve endings that act as photoreceptors. The photoreceptors called rods are sensitive to brightness and allow us to see in dim light. The photoreceptors called cones respond to the varying wavelengths of light that produce different colors. The fovea centralis, in the center of the macula, is densely packed with cone cells. It is the fovea that gives your eye the ability to sharpen an image. The clearest vision-what we call "20/20 vision"-would be impossible without the fovea. Another part of the retina, the retinal pigment epithelium, consists of dark tissue cells that absorb excess light and carry nutrients to, and waste products from, the retina.